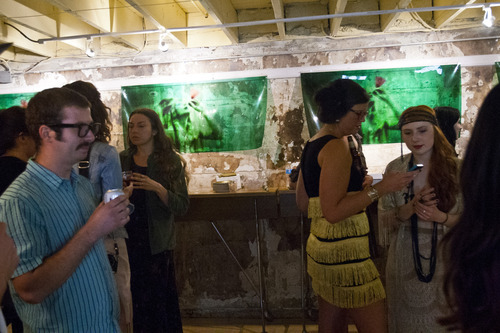 New trend • Pop-up galleries are giving artists a chance to turn an exhibit into an event. 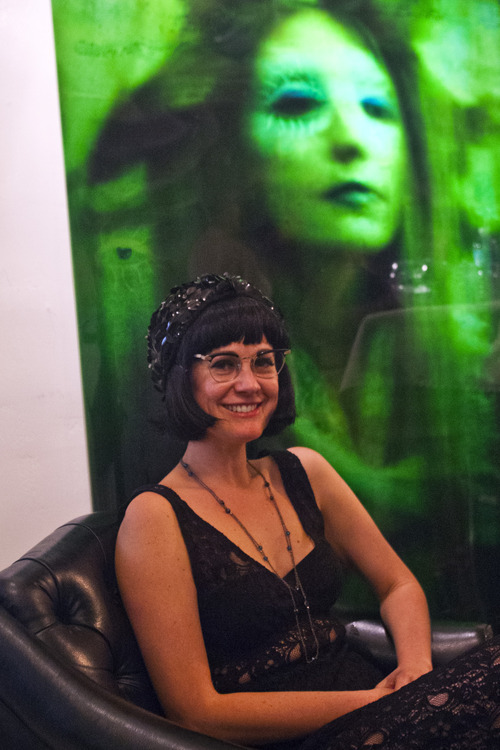 Chris Detrick | The Salt Lake Tribune Artist Teresa Flowers poses for a portrait with pieces from her "Echoes Series" during a speakeasy-style art gallery party at Urban Vintage Thursday May 23, 2013. The gallery was featuring works from artist Teresa Flowers. Chris Detrick | The Salt Lake Tribune Artist Teresa Flowers poses for a portrait with one of her pieces during a speakeasy-style art gallery party at Urban Vintage Thursday May 23, 2013. The gallery was featuring works from artist Teresa Flowers. 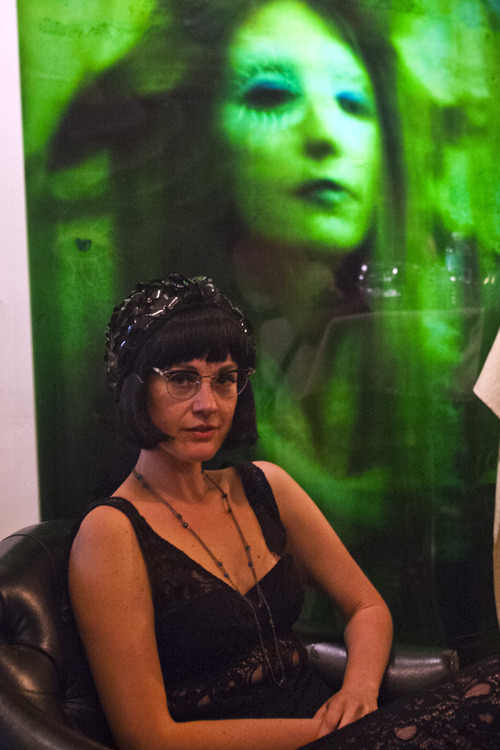 Chris Detrick | The Salt Lake Tribune Artist Teresa Flowers poses for a portrait during a speakeasy-style art gallery party at Urban Vintage Thursday May 23, 2013. The gallery was featuring works from artist Teresa Flowers. 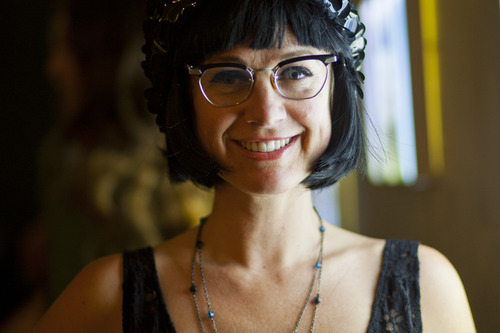 Chris Detrick | The Salt Lake Tribune Artist Teresa Flowers poses for a portrait during a speakeasy-style art gallery party at Urban Vintage Thursday May 23, 2013. The gallery was featuring works from artist Teresa Flowers. 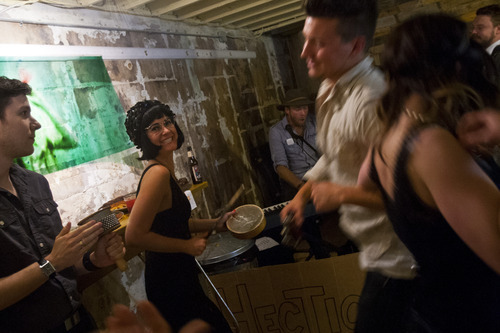 Chris Detrick | The Salt Lake Tribune Artist Teresa Flowers dances as the band 'Hectic Hobo' performs during a speakeasy-style art gallery party at Urban Vintage Thursday May 23, 2013. The gallery was featuring works from artist Teresa Flowers. Chris Detrick | The Salt Lake Tribune Artist Teresa Flowers poses for a portrait with one of her pieces during a speakeasy-style art gallery party at Urban Vintage Thursday May 23, 2013. The gallery was featuring works from artist Teresa Flowers. 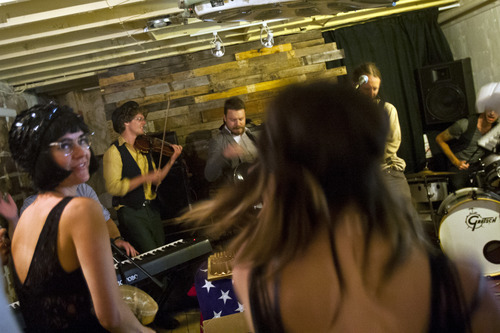 Chris Detrick | The Salt Lake Tribune Artist Teresa Flowers dances as the band 'Hectic Hobo' performs during a speakeasy-style art gallery party at Urban Vintage Thursday May 23, 2013. The gallery was featuring works from artist Teresa Flowers. 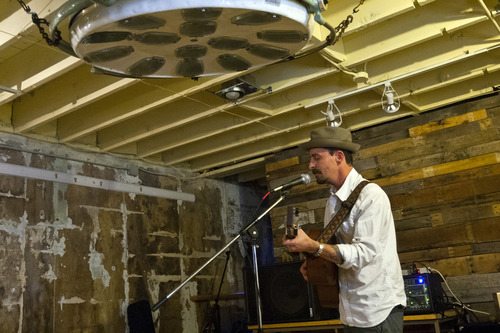 Chris Detrick | The Salt Lake Tribune 'Hectic Hobo' performs during a speakeasy-style art gallery party at Urban Vintage Thursday May 23, 2013. The gallery was featuring works from artist Teresa Flowers. 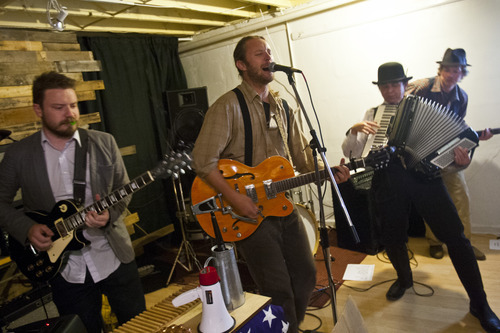 Chris Detrick | The Salt Lake Tribune 'Hectic Hobo' performs during a speakeasy-style art gallery party at Urban Vintage Thursday May 23, 2013. The gallery was featuring works from artist Teresa Flowers. 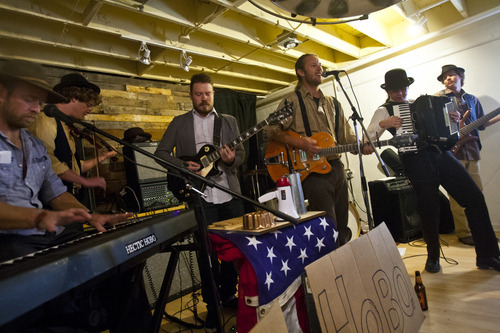 Chris Detrick | The Salt Lake Tribune Guests listen as the band 'Hectic Hobo' performs during a speakeasy-style art gallery party at Urban Vintage Thursday May 23, 2013. The gallery was featuring works from artist Teresa Flowers. 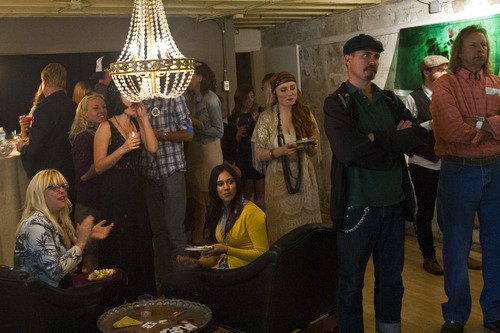 Chris Detrick | The Salt Lake Tribune Guests listen as the band 'Hectic Hobo' performs during a speakeasy-style art gallery party at Urban Vintage Thursday May 23, 2013. The gallery was featuring works from artist Teresa Flowers. Chris Detrick | The Salt Lake Tribune Jay William Henderson performs during a speakeasy-style art gallery party at Urban Vintage Thursday May 23, 2013. The gallery was featuring works from artist Teresa Flowers. Chris Detrick | The Salt Lake Tribune Teresa Flowers, second from right, poses for a portrait with some of her friends during a speakeasy-style art gallery party at Urban Vintage Thursday May 23, 2013. The gallery was featuring works from artist Teresa Flowers. 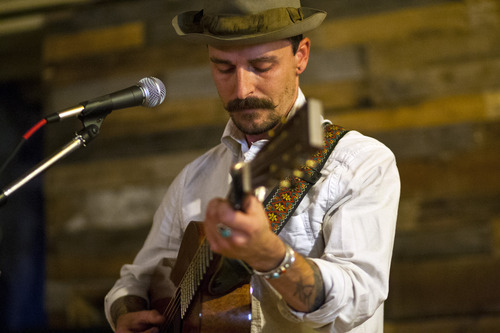 Chris Detrick | The Salt Lake Tribune Jay William Henderson performs during a speakeasy-style art gallery party at Urban Vintage Thursday May 23, 2013. The gallery was featuring works from artist Teresa Flowers. On a pleasant spring Thursday night in downtown Salt Lake City, the door to the antique store Urban Vintage is open, and a guy in a white shirt is sitting at the desk in the back. One has been told to walk up to the guy and say a single word: "Echoes." The guy then grants the person access to the basement. The basement is well-lighted and uncluttered, and the party is just getting started. 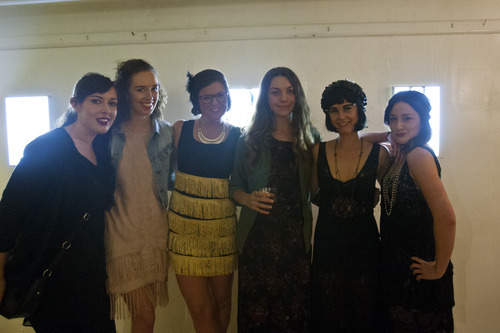 Women are wearing dresses from the flapper era. The men are more casual, though some are wearing stylish hats and suspenders. A band is playing. There&apos;s a spread of pizza and hors d&apos;oeuvres. Vodka and an herbal liqueur, distilled up north in Ogden, are being poured. And on the walls, there is art. On one wall are three small lightboxes, with layers of clear plastic on which have been printed photographs and drawings. On the opposite wall are large pieces of film, tinted green with more photo images. Don&apos;t go looking for this art exhibit now. It&apos;s not there. The one-time event  part art exhibit, part swinging party  was an example of a pop-up gallery, a burgeoning trend in the art world. The idea is to give artists a chance to show their stuff outside the traditional gallery setting. The artist can take over unused space  a basement, a studio, an empty office  for a night, a week or sometimes longer. "We call the gallery space an urban underground," said Brett Millet, who manages the basement gallery at Urban Vintage. Unexpected places • The Urban Vintage space had its first pop-up show last Halloween, with 15 artists showcased. Millet said that first event drew some 500 people, from friends and families of the artists to people just interested in the art scene. 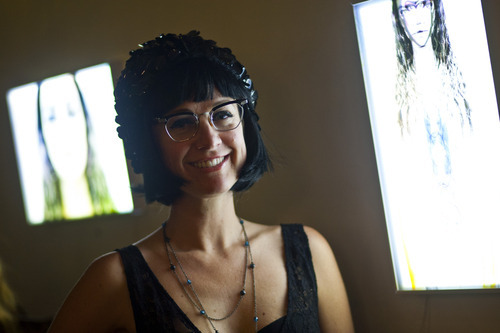 At the recent Urban Vintage show, the see-through lightboxes were mock-ups of an ambitious work now in the mind of Salt Lake City artist Teresa Flowers. Flowers threw the pop-up event as a "thank you" party for people who have donated to her ambitious Kickstarter fundraising campaign, and she came up with the "speakeasy" theme. Her planned installation, called "Echoes" (which explains the password to get into the party), will incorporate 10 large versions of the light boxes  each 6 feet high and 4 feet wide. They will be arranged so that people can walk in between the boxes, looking through the transparencies to see different versions of the image depending on where they stand. "Nothing like this has been made in Salt Lake City before," Flowers said. A few blocks west, the production company Studio Elevn has a large space that hosts events and is frequently used by artists. "The space is kind of funky. It looks like a New York-style loft," said Michael Ori, owner of Studio Elevn, which opened about a year ago just west of Pioneer Park. "We just try to keep a lot of variety here, kind of make it interesting," Ori said of the space. "Every time you come in, the studio looks completely different." And a wide variety of people use the space, he said. It&apos;s been rented out for wedding receptions, used for business conferences, and every three months is home to a social-networking gathering of young entrepreneurs. Ori estimates thousands of people see the art on display every month, and many of them wouldn&apos;t normally set foot in an art gallery. While the artists who use Studio Elevn may display their art for weeks at a time, Utah painter Jeffrey Hale&apos;s next big show will be one night only and for a select clientele. Hale&apos;s show, which he bills as a "new alternative portrait exhibition," will be on display June 21 at the design firm Architectural Solutions&apos; showroom on Salt Lake City&apos;s Foothill Drive. It will feature 20 of his expressionist-style portraits. It&apos;s also catered, with drinks and a DJ, for what he hopes will be about 100 invited guests. Hale calls the one-night event "a more intimate setting where I can discuss my work. … And I get to play art director." At a traditional gallery "you might get a solo show once every three years," said Hale, who displays at one in Salt Lake City and another in Park City. There&apos;s also the issue of money. At a pop-up, he said, "I don&apos;t have to split 50-50." Gallery effect • The trend is new enough that it&apos;s too early to know whether traditional galleries are losing money. "It kind of cuts out the middleman," said Shilo Jackson, owner of Salt Lake City&apos;s Kayo Gallery. "If they&apos;re able to do that and make a profit, then why are any of us [galleries] here?" Jackson said while she&apos;s "very supportive of art, and local artists especially … if it draws from my crowd on my biggest opening night, that&apos;s a little more concerning." According to Heidi Gress, a publicist who helps set up pop-up events, pop-up galleries are perfect for artists whose work isn&apos;t commercial enough to draw a traditional gallery&apos;s interest  or for those who don&apos;t want to pay commission fees. And, for art lovers, a pop-up show "creates more approachability. Here it&apos;s about a connection with the artist. … Most galleries are traditional, and going into an art realm can be daunting." "It&apos;s all about who you know or who you&apos;ve sold to," Millet, at Urban Vintage, says of established galleries. "For us, the mission is not to display work which is going to sell. It&apos;s to expose people to ideas." Flowers is represented by a major Salt Lake City gallery, and the work she displays there, she said, "is more commercial based" than her proposed "Echoes" installation. At a pop-up gallery, she said, "it&apos;s more based on what you want to express. … I have complete control over what goes up."